When Auburn police responded to a suspected trespassing on Wednesday, they found an unusual suspect: an opossum. Police dispatched to a Spring Street home in Auburn early Wednesday morning apprehended an unexpected trespasser. 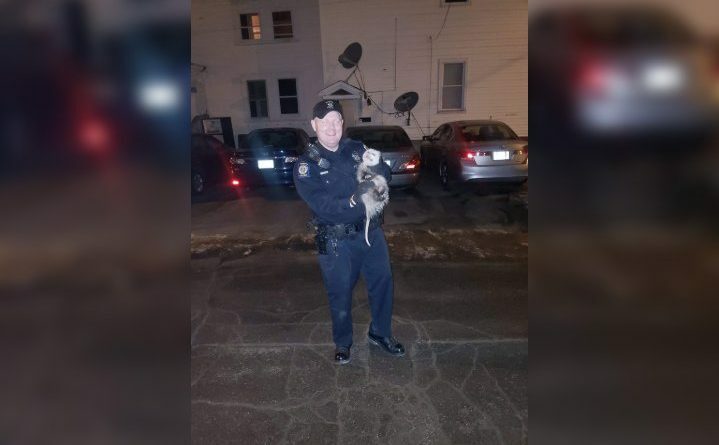 Auburn police Officer Devon Bohacik wrangled an opossum using his baton, a mop and towel, according to the Auburn Police Department. “The opossum offender was issued a warning and sent safely on his way,” Auburn police said in a statement. The wild critter is fairly new to the state, having expanded its territory north into southern Maine over the past decade, the BDN has reported. More and more, Mainers are encountering this highly adaptable marsupial. Opossums have a varied diet, and they are known to feast on insects, small rodents, frogs, birds and berries, according to CritterControl.com.